← When Are the Sins Of Believers Blotted Out? To understand the Fit Man and the Scapegoat transaction, we need to take our minds back to the time of ancient Israel, to see what was required by God of Israel in relationship to their annual Day of Atonement. The Day of Atonement was observed by ancient Israel on the tenth day of their seventh month – originally called Ethanim, and later called Tishri – which corresponds to September and October of our calendar year. This was the day – and the only day of the year – when the high priest went into the second apartment – called the most holy place – of the earthly sanctuary, where the Ark of the Covenant, containing the Ten Commandments – God’s Covenant – was always placed, and where God’s presence was manifested in the Shekinah Glory. The Jewish month Ethanim was called “the month of gifts”. After the 70 years exile in Babylon, it was called TISHRI, and corresponds to part of our September, and part of our October. It was the first month of the Jewish civil year, and the seventh month of their ecclesiastical year. As you would understand, the 10th day of the 7th month would fall on a different day of the week in every year – sometimes it would fall on the 1st day of the week, or the 5th day of the week, or the 3rd day of the week, and on special occasions it would fall on and coincide with the normal 7th day of the week – the Sabbath. Whatever day of the week in each year on which the annual Day of Atonement fell – that day was regarded by the Jews as more sacred than any other day in their yearly round of religious services. IT WAS ALWAYS KEPT AS A SABBATH DAY AND A FAST DAY – NO MATTER ON WHICH DAY OF THE WEEK IT FELL IN EACH YEAR. The Jewish name for the Day of Atonement is Yom Kippur. In the year 1997, the Day of Atonement – the 10th day of Tishri – fell on a regular 7th-day Sabbath, and would have been recognized by the Jews as a High Day – like a double Sabbath. On our calendar, it corresponded to the 11th day of October 1997. Because the Jews do not recognize B.C. or A.D. [through their rejection of Jesus as their promised Messiah], the year 1997 was, to the Jews, the year 5758. In 1998, the 10th day of the 7th month [the Day of Atonement] fell on Wednesday, the 30th day of September [in the Jewish year 5759]. That day was observed as a Sabbath, even though it fell on a Wednesday. In the year 2000, the 10th day of the Jewish 7th month Tishri fell on Monday, the 9th day of October – in the Jewish year 5761. Even though a Monday, that day was religiously observed by the Jews as a Sabbath. God’s people today, modern Israel, are no longer required to keep the Old Testament Day of Atonement, but the Day of Atonement itself, and all the services and transactions that took place upon that important and significant day in Ancient Israel, have far-reaching lessons and instructions from God to His people who are living in these last days of the earth’s history, just before Jesus comes. The first goat, whose blood was shed as a sin offering, represented Jesus. The goat whose blood was NOT shed – the Scapegoat – represented Satan. The sins of Israel were placed upon the Scapegoat [Satan] – by the High Priest [Jesus]. THE SINS OF ISRAEL WERE NOT PLACED UPON THE SCAPEGOAT UNTIL THE MINISTRY IN THE SANCTUARY – REPRESENTING THE WORK OF JESUS AS OUR HIGH PRIEST IN THE HEAVENLY SANCTUARY – WAS FINISHED. 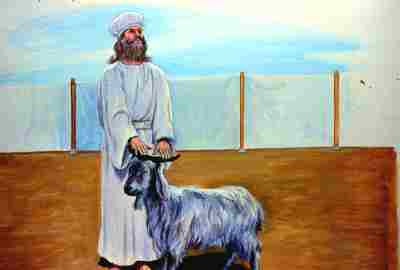 The Scapegoat was then led into the wilderness to be forever separated from the congregation of Israel. The mainline Protestant Churches believe and teach that the Scapegoat represents Jesus – because it had the sins of Israel placed upon its head. But the Scapegoat CANNOT represent Jesus – Why? BECAUSE THE SCAPEGOAT NEVER HAD ITS BLOOD SHED; Because the scapegoat was led away into the wilderness; Because the scapegoat was to be forever separated from Israel; AND BECAUSE THE SCAPEGOAT ONLY HAD THE SINS OF ISRAEL PLACED UPON IT AFTER THE YEARLY WORK IN THE SANCTUARY WAS FINISHED. Jesus shed His blood for the sinner. Jesus was never to be forever separated from the camp of Israel as the Scapegoat was. The Scapegoat represents Satan – not Jesus. Those who say that the Scapegoat represents Jesus as their Saviour are unwittingly worshipping Satan instead of Jesus. AFTER the high priest had ‘made an end of reconciling the Holy Place, and the Tabernacle of the congregation, and the altar,’ he, in figure, took the sins of all the people upon himself and left the Sanctuary. Anyone who had not confessed his sins at that time, was ‘cut off from among his people.’ In the Sanctuary service, this represented the final close of probation. Jesus did not die to immediately cancel sin, but His death upon Calvary opened up the way for God to deal with sin. Jesus shed His blood, as was represented to Israel in the shed blood of the sacrificial offerings, so that a means might be provided to transfer sin to the Sanctuary. Jesus made an atonement for the sinner, to release him, through repentance and confession and forgiveness, from the guilt of sin, but He did not die to cancel the sin – until the destruction of all sin and sinners in the lake of fire. The sin was to remain upon the Books of Record until the Final Atonement. In the final Judgment, Satan will bear his own sins, AND HE WILL ALSO BEAR, IN ADDITION TO HIS OWN SINS, THE SINS OF ALL THE REDEEMED. The wicked, who have rejected God’s mercy and God’s plan for their salvation through Jesus, will bear their own sins. This is contrary to Bible and Spirit of Prophecy teaching. Satan’s responsibility for, and his part in the sins of others, are his own sins anyway. Satan must bear the final punishment for his own sins, BUT HE MUST ALSO BEAR THE FULL PUNISHMENT FOR ALL THE SINS OF THE REDEEMED, NOT JUST HIS PART IN, OR HIS RESPONSIBILITY FOR, THOSE SINS. In the Old Testament Sanctuary service, the Scapegoat did not have the sins OF THE WICKED placed upon its head at all – only the sins of those who had had their sins transferred to the Sanctuary, through repentance and confession and acceptance of the sacrifice provided to cleanse them from all sin. That is why Satan fights so hard to keep the wicked in the broad road that leads to destruction, and why he fights so hard to have those who have accepted the sacrifice of Jesus, to backslide again into the broad road that leads to destruction. That is why he fights so hard to keep lost souls where they are, in a lost condition, and why he fights so hard to have those who do accept Jesus as their Saviour, to give up their allegiance to Him, or to yield to their doubts and their discouragement, and to give up the battle before Jesus finishes the work for their salvation in the Heavenly Sanctuary, and before Jesus comes to claim them as His own. WHO, THEN, IS REPRESENTED BY THE FIT MAN, WHO LEADS THE SCAPEGOAT AWAY SAFELY, WITHOUT ESCAPING, INTO THE WILDERNESS? After the sins had been placed upon the Scapegoat, the Scriptures say that the Scapegoat had to be led away by the hand of a Fit Man into the wilderness. This Fit Man was NOT the High Priest. The High Priest represented Jesus, therefore the Fit Man to lead the Scapegoat away is not Jesus. The Fit Man was one chosen from the children of Israel, and he carried the heavy responsibility of making sure that the Scapegoat did not escape until it was safely taken away into the wilderness. As the Scapegoat was being led away, it would naturally make a mighty struggle to escape, yet it could not escape, because it was held fast by the chosen Fit Man. The 144,000, who will be a special company of people living upon this earth, who have been able to do what others before them have not been able to do, and who will be a company of God’s people who will be “wondered at” for what they have done. The 144,000 are those of God’s people – right around the world – who enter by faith into the Second Apartment – the Most Holy Place – of the Heavenly Sanctuary – by faith with Jesus – into the Judgment of the Living – to have their sins blotted out, and to receive the Seal of God in their foreheads. They will have passed the Final Test of the Sunday Legislation, and will be the ones who have the Holy Spirit poured out upon them in mighty power, to benefit from and to participate in the Latter Rain, and the Loud Cry of the Third Angel’s Message when it takes place. All through the ages, those who have become followers of God have sometimes, and even many times in their experience, fallen under Satan’s temptations, and have needed to go to God with tears of repentance, to seek His forgiveness for their sins. And the whole universe of God – the angels and the inhabitants of all the unfallen worlds – need to be totally reassured that, when God accepts all the redeemed into Heaven, that not one of them will EVER fall back into sin again – throughout all eternity. Some of that number have even accepted Jesus as their Saviour in the 11th hour of their lives, and some even on their sickbeds, just before dying. What about the thief on the cross? If some of these final subjects of God’s kingdom had been able to continue living for a few more years, they might very well have fallen into sin through temptation, and needed to be forgiven by God. It is just as if God says to Satan, as He said to Satan of Job “Here are My people, Satan. Do with them as you wish, only you cannot take their lives.” It will seem as if God has hidden Himself from them, as they pass through the period known as the Time of Jacob’s Trouble. They will be put through every trial that Satan could ever devise against them. They will seem to be shut out from God’s presence – and they have no Intercessor in the Sanctuary. Satan has full charge of the world, and the wicked join with all the legions of darkness, to come against God’s people, even with a death decree, to try to overthrow them and destroy them. Oh, if Satan could lead one of the 144,000 into sin, after the final close of probation – if he could lead just one of them to depart in the least particular from keeping God’s Law, he would triumph. This explains why there must be a final Time of Trouble before Jesus comes. If the Scapegoat should escape, all Israel would lose their lives, not just the 144,000. God is waiting for a people through whom He can demonstrate that all of Satan’s charges are false. God is going to risk everything upon the 144,000, for if the Scapegoat should escape, the Plan of Salvation would be proved to be insufficient, and Satan’s accusations would prove to be justified. What a tremendous responsibility rests upon the 144,000. No wonder they go through such anguish during the Time of Trouble, and the Time of Jacob’s Trouble. It is not that they fear that they themselves might lose their lives, for they would not shrink even from torture or from death. They will reach the place where they would, for the sake of others, even gladly sacrifice their own lives. They would be prepared to sacrifice everything, as did Jesus before them. But there is one thing they fear – they fear that they will bring disgrace to God’s eternal Throne, and to the One they love, who sits upon that Throne. In the Plan of Redemption, Jesus not only demonstrates to all the unfallen angels and the unfallen worlds His wonderful redeeming love, and the immutability of His Law, but He also gives them an everlasting assurance that, having seen the results of Satan’s rebellion and downfall, and the results of his lying charges against God’s government and against God’s Law of love – THAT SIN WILL NEVER RISE UP THE SECOND TIME, RIGHT THROUGHOUT THE CEASELESS AGES OF ETERNITY. The unfallen angels and the inhabitants of all the unfallen worlds could not perhaps be sure that those who have died, when raised, would not fall again. Many of these, if they had continued living instead of dying when they did, might still have fallen and sinned and needed forgiveness, before they eventually did die. But God is going to have, right in the very end of time, and under the very worst and most trying conditions, and just before Jesus comes, a demonstration that there will be a people who WILL be able to live through the worst Time of Trouble this world has ever seen, WITHOUT A MEDIATOR – BY BEING KEPT BY GOD’S POWER ALONE TO KEEP HIS LAW, without sinning, through that time. This will be God’s demonstration to all the universe that SIN WILL NEVER RISE UP THE SECOND TIME. THESE PEOPLE, THE 144,000 WHO GO THROUGH THE FINAL TIME OF TROUBLE WITHOUT A MEDIATOR, become the “Fit Man” who holds fast the Scapegoat that it does not escape – from the time that Jesus places the sins of Israel upon Satan’s head right through until Jesus comes – when Satan is finally “led away” and banished to the wilderness of this desolate earth for the 1000 years – the Millennium. During the Time of Trouble, God allows Satan to try His people to the utmost – just as He allowed Satan to try Job, “but without taking their lives.” Satan will do everything within his power to hurt, and tempt, and persecute God’s people, even by bringing the whole world against them, causing them terrible mental and physical anguish and suffering, all in his endeavour to try to cause them to sin. In this way “he makes a mighty struggle to escape” but he will be held fast by the hand that leads him. Although God’s people go through a time of terrible anguish, described as the “time of Jacob’s trouble,” yet they are “eternally secure from the tempter’s devices,” AND THEY WILL NOT WANT TO, NOR WILL THEY SIN during that time. If they did, then Satan’s charges that “man cannot keep God’s Law” would be shown to be correct. But “the Scapegoat is held fast by the hand that leads him.” And when the battle is finally finished, and Satan, the Scapegoat, is led into the wilderness, NEVERMORE TO COME INTO THE CAMP OF ISRAEL, then there will be shouts of triumph from not only the redeemed, but from all the angels, and from all the inhabitants of the unfallen worlds. When men build a prototype of a new type of aircraft, with features different to anything else that has ever been taken into the air, to fly at speeds that have never ever yet been reached by men, their greatest concern is that the aircraft will stay together, and not fly apart, under normal flying conditions, and especially under unexpected and unprecedented weather conditions as can sometimes be experienced. So what do they do, before the first text flight takes place. They put that aircraft into a test tunnel, while it is still on the ground, and subject it to wind and turbulence forces many times exceeding that which it will ever meet under all and every flying condition in the air. If the plane passes that rigid wind-tunnel test, it is ready to be produced and flown with the precious lives of others entrusted to it. The 144,000 are like that – God’s test-tunnel company, who, after probation is closed and they have to live without a Mediator in the Heavenly Sanctuary, they are put through God’s test-tunnel experience of the final Time of Trouble, to show that they can withstand the fiercest attacks of Satan and his followers, and not sin or break God’s Law under the most extreme test – in thought, word, or deed. They will prove that, through the strength of God, and the height and depth of their own special Christian experience, they are eternally secure from the tempter’s devices. All the rest of the Redeemed will never fall throughout all eternity, because the 144,000 have never fallen through their final and supreme test of the Time of Trouble experience. This special experience and work of the 144,000 explains why they will be a people wondered at, and will enjoy special privileges in the Kingdom of God. Let us strive with all the power that God has given us to be among that number. Posted on October 8, 2009, in Day of Atonement and tagged Aaron, Biblical Sabbath, Hebrew calendar, Hekhal, Israel, scapegoat, Scapegoating, Tishrei, Yom Kippur. Bookmark the permalink. 4 Comments. Revelation 20:1	And I saw an angel come down from heaven, having the key of the bottomless pit and a great chain in his hand. The people together with Christ who would end enter in this conflict from Adam and Eve through to the coming of Jesus. The bible identifies the final bruising of Satan’s head. What did Apostle Paul speak of? The prophecy. The God of peace shall bruise Satan under YOUR feet. Whose feet? The soldiers of Christ so that they become amalgamated with him seed singular. Seed meaning one. Jesus his body, his remnant church. To us has been given the privilege of laying up treasure in heaven. This we may do by following Christ. He came to our world to demonstrate to the universe that man, his eyes fixed upon God, can be an overcomer. Thus was fulfilled the promise that the seed of the woman should bruise the serpent’s head. Christ humiliated Himself to stand at the head of humanity, that we might be heirs to an immortal inheritance in the kingdom of glory. 20:3	And cast him into the bottomless pit, and shut him up, and set a seal upon him, that he should deceive the nations no more, till the thousand years should be fulfilled: and after that he must be loosed a little season. Here is the grand climax of the bruising of Satan’s head which is an ongoing conflict as we just read between Christ and his soldiers and between Satan and his seed. I will lay thee before kings… the bruising of Satan’s head took place at the cross but it wasn’t completed. While they cry for the abominations done in the land with unutterable sorrow they weep over their own sins. Will not God avenge His own who cry day and night unto Him? Yes He will. That is what bruises Satan’s head. It bruised Satan’s head when Jesus suffered and His remnant people will bruise Satan’s head in this method. The cry of the remnant and the cry of Jesus is the death knell of Satan. can the fact that it was said that the fit represent the 144000 be proven in scripture. We should be careful when we interpret scripture lest we make errors. please note that everything around the santuary is salvation-based and almost everything represents Christ.